Works: Re-roofing and building works. Job Details: Removal of existing roof and rooflights. Redecoration of steel trusses. Installation of reinforced bitumen membrane roofing system. New rooflights fitted. Works: Liquid urethane and roof lights. 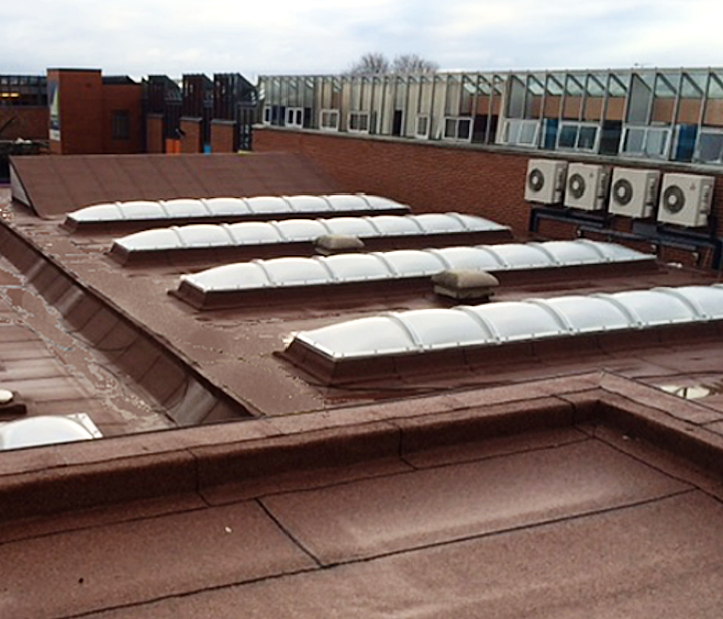 Job Details: Existing mastic asphalt roof overlaid with liquid urethane system. Rooflights removed and replaced. Renewal of mastic joints. Sealing of redundant smoke vents. Works: Roof refurbishment with green system. Job Details: Removal of existing roof. Upgrade of existing drainage system. Installation of a new insulated, multi-layered green roof system. Ecology experts consulted to select the most suitable substrates and plants. The habitats include wildflower meadows, wetland areas where ponding will be encouraged, planted walls, bug walls, a bluebell wood in a shaded space and bee friendly planting. The Museum of London is one of the largest retrofit green roof projects in London. Works: Tiling, leadwork and building works. Job Details: Removal of existing roof, rooflights, flues and cables. Turret stripped of old lead. Insulation replaced, pitched roof re-tiled and new rooflights installed. New sphere built for turret and new lead applied. Guttering and cast iron downpipes replaced. Cables reinstalled. Works: Re-surfacing, repairs and application of heavy duty waterproofing system. Job Details: Re-surfacing of main car park. Repairs to existing asphalt surfaces. Application of high performance waterproofing system to car park areas. Renewal of car park lines, colour coding bays and marking of access routes. Overlaying existing roof to central core. Structural repairs. Works: High performance felt system, hybrid uniformed / tapered insulation, rooflights and windows. Job Details: Refurbishment of felt roof areas. Removal of windows and rooflights. Installation of modular rooflights and windows. Internal decorations. Works undertaken in-part during term time with minimal disruption to pupils and staff.